Rumors of a 17″ iMac had been circulating since 1998. Apple finally did it by introducing the eMac to the education market at the end of April 2002 – and to the consumer market that June. The base 700 MHz CD-ROM model does not include a modem; all other models have one. The top-end 800 MHz model released in August 2002 includes a SuperDrive. The eMac came with a new white no-button mouse and white keyboard. It also has video out for external displays, which will mirror whatever is displayed on the internal monitor. 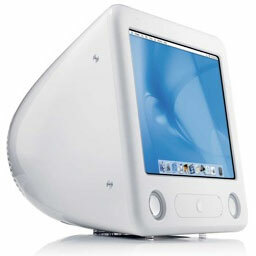 Although it has the same dimensions as the original iMac, the eMac is one heavy beast – 50 pounds vs. 35-38 for the 15″ iMacs. The 2002 and 2003 eMacs are USB 1.1 machines. If you want or need USB 2.0, look at the 2004 and 2004 eMacs. While you can install and run Leopard on this eMac (see our article on Unsupported Leopard installation), we have reports that this model may lock up when going to sleep -and possibly when the screen saver activates as well. If you do run Leopard on a first generation eMac, we recommend turning off the screen saver and not allowing it to go to sleep. A week with an eMac finds it an excellent value, Dan Knight, Mac Musings, 2003.07.09. Apple’s lowest cost computer acquits itself very nicely in its first week on the job at Low End Mac. I happened to just but one of these last week! !